Jonathan Morris has written quite a few audio adventures during his time with Big Finish. But Flip-Flop is possibly one of his best stories in terms of its imagining. It is a very unique take on time-travel, looking into how if you chance the past, you then have to live with the future, no matter if that's good or bad. I was quite surprised that this has two cd's on with the same story, just told from different perspectives. It is hard to know which to listen to first but in the end, it doesn't really matter. And I was also stunned to realise that this kind of storytelling does work. It is a convoluted mess, in a good way, with some great humour and is one of the best Seventh Doctor stories out-there. The first thing that comes to mind when thinking about this story was how Morris managed to plot it. It must have been a nightmare. Coming up with two parallel realities in the present and managing to somehow juggle two different versions of four characters must have been head-spinning. And then he goes and throws in a little bit of time-travel just to make events in the present become even more confusing. This story really is one of the best examples of telling a parallel universe story in a really interesting way. Each scene lines up perfectly from one CD to the next, or previous if you really want to be confused! And the fact that it is done with a great sense of humour running throughout is yet another achievement. 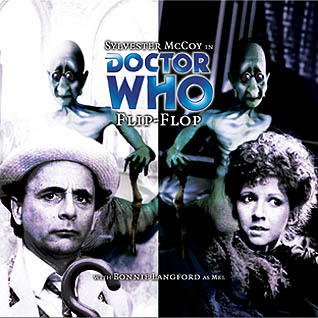 I really enjoy hearing stories which pair up Sylvester McCoy with Bonnie Langford. Given that their television adventures together aren't really the best stories that are on offer, it is really through the books and these audio adventures that their pairing has worked out as well as it has. This really is the perfect adventure for the Seventh Doctor. It really brings out his funnier side as well as his intelligence which is hidden beneath his clownish exterior. It was nice to see the Seventh Doctor getting swept up in the events unfolding around him and not just being portrayed as the master manipulator that he was in the television series. Bonnie Langford is great here too. She gets a number of funny moments or lines which help us Doctor Who fans to see Melany Bush in a new light. But another source of amusement from this story comes from a race of villains called The Slithergees. It is an absurd idea to have an alien race who conquer through political correctness induced guilt and not ray guns and spaceships. But it is also very funny and a welcome jab at the overly politically correct society that we lived in when this story was released and the one we still live in now.